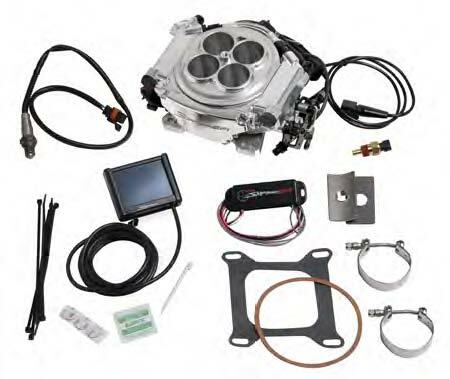 Holley Sniper EFI self-tuning fuel injection systems from Holley deliver all the benefits and none of the hassles. These full-featured throttle bodies are easy to install, can support a lot of horsepower, and will keep your budget intact. They put an end to carburetor cold start issues, hesitations, vapor lock, and flooding. Each of these Holley Sniper EFI systems hit the performance mark with a mounted ECU and an integrated fuel pressure regulator. Theyre self-learning (no laptop is needed for set up) and they include a small color touchscreen to help you set up and tweak. Holley also provides you with a choice of finishessatin black, gold and polished aluminum. Make your conversion simple, while getting maximum bang for your buck, with a Holley Sniper EFI self-tuning fuel injection system from Holley.